Stacey Marjoram, Director of Physical Education poses with her Teacher of the Year award at Charter Day School in Leland, NC. 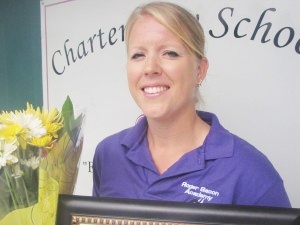 Charter Day School in Leland, NC recognizes the Teacher of the Year for 2011. “What’s your favorite subject?” is a common question posed to children and most times the answer comes back resoundingly “P.E!” We all know math, reading, and science are all very important for developing life skills in children, but so is that favorite subject: health and physical education. Charter Day School (CDS) is proud to announce their Teacher of the Year for 2011, Mrs. Stacey Marjoram, Director of Physical Education. Stacey has been with the school for five years and started working at CDS after graduating from East Carolina University where she received her B.S. in Physical Education. Stacey explained that she grew up being very physically active, “I was raised in a military family and since we moved every three years our parents encouraged us to use physical activities and sports as a way to meet new friends.” Stacey also got first-hand experience for her future career – her mom was a physical education teacher as well. 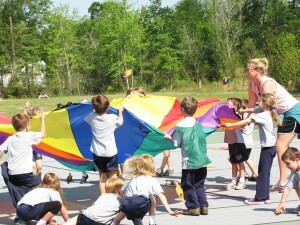 Coach Stacey leads a physical education class for elementary students at Charter Day School in Leland, NC. Read the Teacher of the Year letter here.